The 30th of November 2017 saw the first ever #Huckathon, which happened even before we had come up with the name! The UoM Mapathon was hosted by the Geography Department at the University of Manchester, and was our first attempt at running such an event. 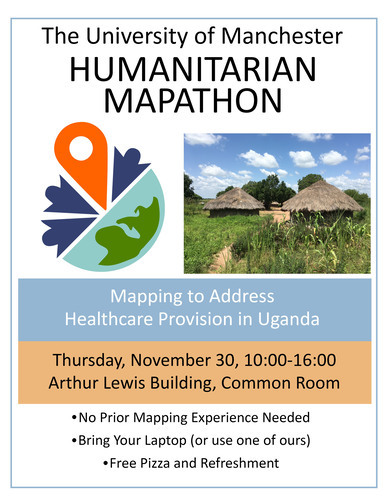 A mapathon is an event where volunteers gather together and create maps of areas that have not previously been mapped, normally for the purposes of humanitarian work. This was the beginning of our journey to map the Acholi sub-region of Northern Uganda, a fertile but impoverished region with a population of approximately 2 million people and a land area of approximately 28,000km2. The small town centres and the surrounding remote villages were badly affected by a prolonged civil war (1986-2006), which has left people of all ages suffered from poverty, malnutrition, disease, mutilation and Major Limb Loss (MLL) related to gunshot wounds, mines and punishment amputations. Unfortunately, the majority of victims in this region have no access to health or rehabilitation services and the level of requirement for those services is currently unknown. One of the biggest barriers to helping people in this region is the lack of any detailed mapping of the region. As such, we launched the mapathons with this first event, where one hundred volunteers came along from around the University, enjoyed some complimentary pizza (! ), and contributed to a new, freely available map of the area by drawing around huts, buildings and tracks on satellite photography. It was wonderful to see how many people were willing to give up their time to help produce these vital maps (including some entire seminar groups arriving together! ), and we hope that the event series continues to grow and include more volunteers from elsewhere in the University. The map data that was created at this event, and created goes to OpenStreetMap, meaning that it is freely available to anyone that wants it, and we are going to produce a series of map sheets for the Acholi Region, which again will be freely available to anyone. 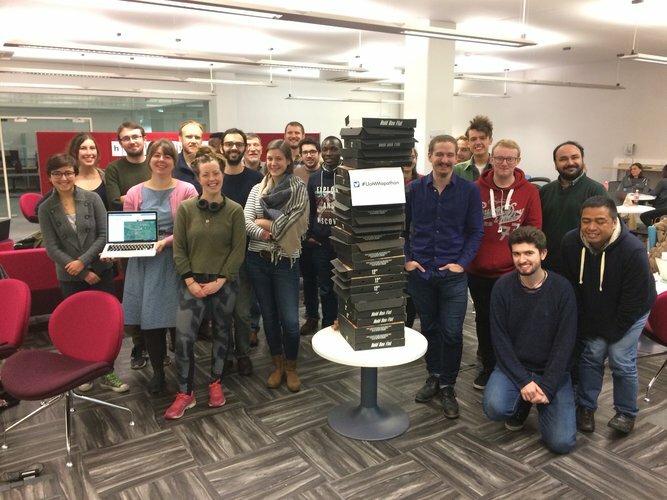 The mapathon was organised by the #Huckathon team, and 28 pizzas were kindly provided by the Student Experience Fund from the Department of Geography at the University of Manchester.